If you have played slots in a casino then there is a good chance you have seen or wagered on a Monopoly slot machine. There are a variety of different versions out there from various software makers, but I will be focusing on Monopoly Pass Go from online slot games developer IGT. 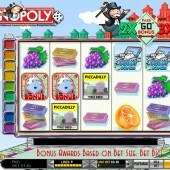 This is mainly because this game has an online version available at several online casinos. There is also a progressive version of this slot, which is linked to other Megajackpots Monopoly slots and has some incredibly large payouts. Monopoly Pass Go combines lots of symbols you would expect to see in a game of Monopoly with wilds and two different bonus rounds. Rich “Uncle” Pennybags, aka. Mr Monopoly or as some slots players may know his Whiff, hops around the screen when you get winning lines or hit bonuses. The two bonuses vary in reward, with the Community Chest being the lesser of the two. When you get 3 community chest bonus symbols you then get to pick one to reveal a bonus. Basically, this is your standard Pick'em Bonus which is great to see included on the slot but it isn't the most imaginative bonus feature I've seen. Better rewards can be experienced with the Pass Go Bonus, which is triggered when you get 3 bonus scatters on reels 1, 2 and 3. These symbols do not appear on any other other reels, so it can be a bit frustrating trying to get all three to appear at the same time. When you do land them then you get to pick one to reveal how many free rolls on the Monopoly board you get. The screen then turns into a mini version of the Monopoly board and you work your way round by rolling the dice. The main hazard is the Go to Jail square, which stops your bonus if you land on it. 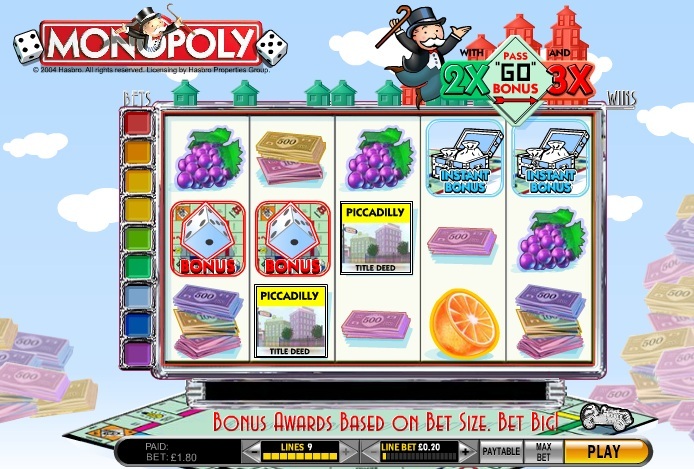 There are several other Monopoly slots that IGT have released under licensing with Hasbro, which include the addictive Monopoly Here and Now slot and the slightly less thrilling Monopoly Dream Life slot. It is worth mentioning that the online version of Monopoly Pass Go slot has a 96.01% payout ratio (RTP), which is pretty good for a slot game.